Christopher Steiner of the Guardian, writing about tech and surveillance, talks about a rather chilling thought in a brilliant article titled Edward Snowden may be the last of the human spies... something that will happen, whether we like it or not. Human nature makes it predictable that organisations such as the NSA would be cataloguing phone calls and other electronic interactions between humans. 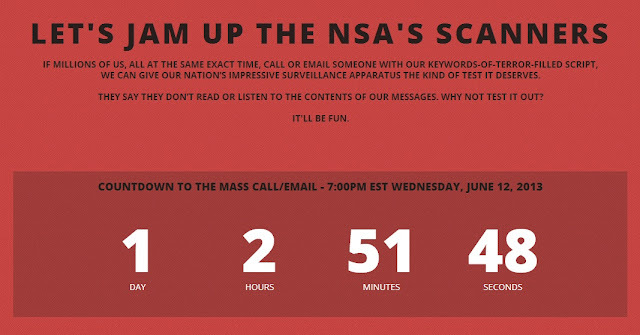 But Edward Snowden's revelations also tell us how far electronic snooping has yet to go. While the din of outrage still resonates, we should be thankful that Snowden – a human being – actually exists. In the future, the world may never be alerted to such breaches of privacy because there will be no humans involved in spying at all. Just as algorithms have conquered our stock markets and our musical tastes, so too will they conquer surveillance. Even the most human of tasks, snooping, will become the province of the bots. BRT touches upon this in Big Data - With a Twist with mention of Minority Report and the human frailties of Agatha, the most prescient of the Pre Cogs used by Pre Crime, a special police squad dedicated to solving crimes before they happen, a notion the NSA might actually be trying to do using predictive analytics combined with big data in order to "protect us" from the vagaries of reality whether we like it or not. Spark Pictures did a documentary on Burning Man, an annual event described by many participants as an experiment in community, art, radical self-expression, and radical self-reliance. 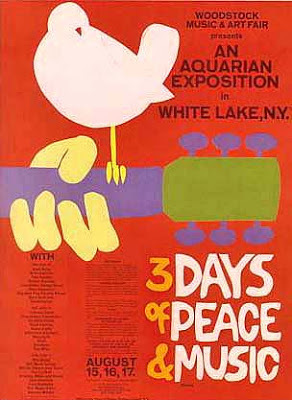 The trailer, seen above, will make you think about the implications of something akin to Woodstock, where people came together, way back when, to participate in an event larger then themselves. 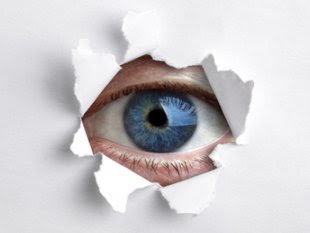 A must read about Surveillance by Alternet's Lynn Stuart Parramore. Chilling to say the least. When I moved to a Czech village in 1994 to teach English, I was fascinated by the cultural difference between Americans like me and my new community. At that time, the oppressive memory of the dreaded Communist secret police, the StB , was still fresh. 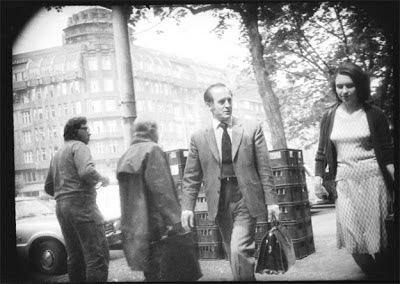 (Check out a haunting series of street photos  snapped by agents in their heyday.) As a brash young ex-pat, born after the era of McCarthy and J. Edgar Hoover, I understood little of what it felt like to live under constant surveillance. The Czechs knew better. Several decades under the watchful eyes of the StB (and before that, the spies of the Habsburg Empire) had molded their attitudes and behavior in ways that were both subtle and profound. 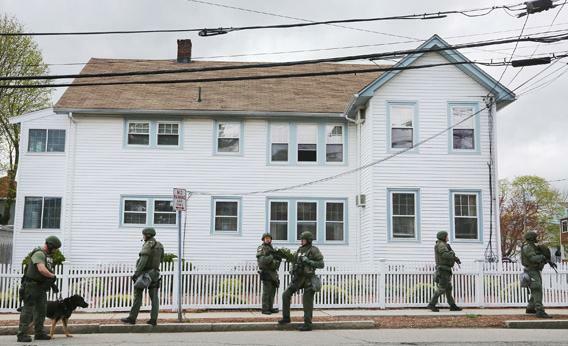 They were on their guard with newcomers. When you got to know them, you might sense a tendency toward fatalism about the future. Signature Czech traits included a sophisticated gallows humor and a sharp sense of the absurd, honed by a lifetime of experiencing Kafka-esque political conditions (Kafka himself was a Czech). Then there was that subversive streak. When you gained their trust, Czechs would often gleefully show you their old smuggled rock-and-roll records or describe a forbidden radio set up in some corner of the house. These proud tales of rebellious triumph over the StB were cast against stories of horror, like a student who told me of the day her daddy disappeared after “talking to the oven” where a radio was hidden. For most Czechs, the salient lesson of the police state was an us-against-them mentality. Only sometimes you didn’t know who “they” were. Seen below is a pix taken by the former Czech Secret Police. Gives you the warm fuzzies don't you think? 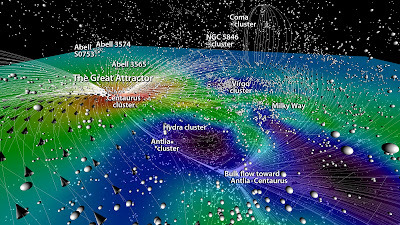 Amazing video showing the local universe in 3D is simply astounding. Worth watching without question to see just how wondrous nature truly is. Aeon is a terrific site, dealing with deep concepts in elegant fashion ranging from the limits of science to the notions of being human in a reality we struggle to understand. 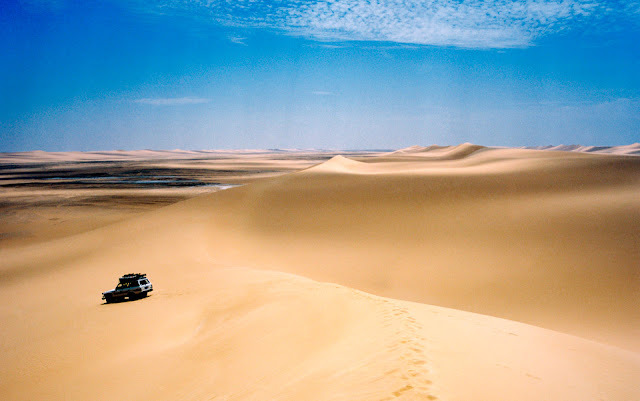 In Robert Twigger's thoughtful piece titled Desert Silence, he touches upon a subject both profound and right, the power of silence and how it applies to being human. There is an Arab saying that the donkey that bought you to the palace must be dismounted before you can enter. If it’s windy, you still get it, the silence. But only at first. Then you notice the wind on clothes, or the rustling of a tarpaulin. If the wind is really high, it’ll be picking up sand and shooting it like mist over the ground — swirls, not cloudlike but dreamlike, silky, low-down patterns of the universe, all lit up. The desert is windy at certain times of the day, sometimes all day. You never go days without wind, but there are always periods of calm. Strangely, they often coincide with that moment of getting out of the car, with its big tough tyres and hot exhaust pipe and ticking, contracting bonnet. You start listening to the silence. You start listening for imperfections, proofs against its existence. Maybe the ticking is reassuring, but it grows less frequent, fainter. People look for proof of their beliefs when they are young, when they are charged with hope. Many give up at what seems a very early age. They prefer the comfort of denial, of nothing with a small ‘n’, a rubbish nothing, easily shouldered aside by music, appetites, money, entertainment and controversy culture, stuff. Cars. The car that got you here, which you can now leave behind. I experienced this kind of profound silence in Death Valley, prior to becoming mostly deaf, and the impact on yours truly was amazing as it forces one to not think, to be in the present as the only thing one experiences in this kind of environment is one's self, a moment that has reamained with me to the present day. Interestingly enough, now that deafness is part of my equation, I experience silence when taking out my hearing aids in order to get away from the incessant noise of modern society. something that annoys my wife to no end. At the same time, I now understand, in small part, how the deaf remain forever separate from the world, existing in a kind of silence the hearing will never experience unless they go to the desert and get away from it all, even if it's only for a short time. 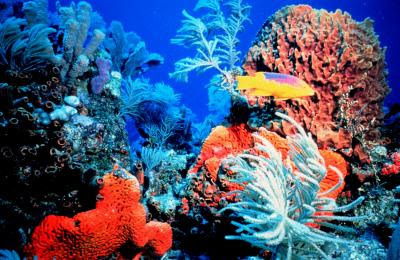 By 2100, coral reefs could join the dinosaurs as extinct entities but in this case, the extinction will be caused by us. Ricke said: "Our results show that if we continue on our current emissions path, by the end of the century there will be no water left in the ocean with the chemical properties that have supported coral reef growth in the past. We can't say with 100% certainty that all shallow-water coral reefs will die, but it is a pretty good bet." Deep cuts in emissions are necessary in order to save even a fraction of existing reefs, according to the team's results. Chemical conditions that can support coral reef growth can be sustained only with very aggressive cuts in carbon dioxide emissions. Just found a very cool YouTube site. Smarter Every Day, a science environment teaching us rubes some interesting factoids about science. The piece seen above explains the mystery of Prince Rubert's Drop. Check it out. Pretty cool without question. In a terrific article in Slate, Brian Jenkins, a terrorism analysis par excellante, articulates the true danger of surveillance 24/7 in Fred Kaplin's piece titled, The Foundation of a Very Oppressive State. The late Frank Church said it best. "I know the capacity that is there to make tyranny total in America, and we must see to it that this agency and all agencies that possess this technology operate within the law and under proper supervision, so that we never cross over that abyss," explained Church. "That is the abyss from which there is no return." PHD's terrific video on plant defenses explains, in large part, why Monsanto's GMO corn is being devoured by the ravenous Corn Borer beetle, something Monsanto is apoplectic about given just how protective of this "wonderful" crop Monsanto truly is. As often stated before, Nature always finds a way. 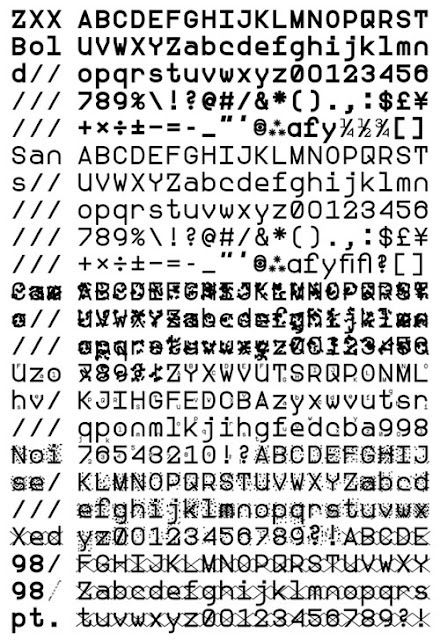 Sang Mun, an extremely talented designer, concerned with the 24/7 surveillance being conducted on us has come up with a set of fonts OCR and AI cannot decipher, something pretty impressive to say the least. What he has done is important, something I bet Thomas Jefferson would have approved of without question. As often stated, tech has no morality, it depends on who using it to see the impact it has on society. This is an example of a good way though it is so sad technology like this has to be created in the first place. The founding fathers must be rolling in their graves seeing what is happening to this once great nation. Seen above are Sang's fonts, which work on Apple and Windows. According to Sang, the X example works best. Are We Rome? FreedomFest 2013 from Smooky on Vimeo. Terrific video showing how Rome descended from a vibrant democracy to a decadent dictatorship with indemic corruption, wealth disparity and surveillance 24/7. Sounds like America, doesn't it? 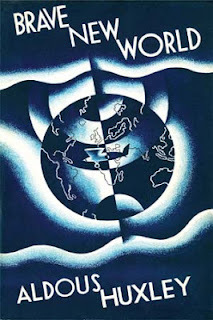 Orwell lives as seen by the fact Snowden is accused of espionage even though he has not given sensitive information to any other country nor was he spying in any way since he was employed by Booz Allen to work as a contractor for the NSA. His "crime" sort of speak, was the fact he blew the whistle on the 24/7 spying exercise, courtesy of the NSA, something we citizens have the right to know about since we pay the bills to enable the NSA to spy on us, a simple fact conveniently ignored by the mainline press and lockstep politicos who routinely call Snowden a traitor and not someone who acted like Daniel Ellsberg, when he released the Pentagon Papers showing the duplicity of the government regarding the fubar known as Vietnam. The US has become a digitally driven combination of Brave New World and 1984, where language is distorted to defend the indefensible while the middle class and the poor get ground into dust by the power elite and the minions who serve them. Can we reverse course? Perhaps, if we are lucky and courageous enough to make a difference but time is running out on a once great nation that really did have an American Dream back in the day. Bill Nye rocks. Science and how it works is the bailiwick he works in and he's right. Science is designed to be disproved, this is why science is right, something to consider before abdicating the right to question in order to believe in whatever. Alistair Chapman is an extraordinary cinematographer. His latest will blow you away. Nature, in the end - rules. others to pick up the tab of supporting our country. Sounds ethical to me, right? Honey bees are a favorite of mine. Videotaping these industrial wonders doing their thing in flowers of all types never ceases to amaze but less of them come around doing what they do best because of what we are doing to their world. We know what is killing the bees. Worldwide Bee Colony Collapse is not as big a mystery as the chemical companies claim. The systemic nature of the problem makes it complex, but not impenetrable. Scientists know that bees are dying from a variety of factors - pesticides, drought, habitat destruction, nutrition deficit, air pollution, global warming and so forth. The causes of collapse merge and synergize, but we know that humanity is the perpetrator, and that the two most prominent causes appear to be pesticides and habitat loss. Biologists have found over 150 different chemical residues in bee pollen, a deadly "pesticide cocktail" according to University of California apiculturist Eric Mussen. The chemical companies Bayer, Syngenta, BASF, Dow, DuPont and Monsanto shrug their shoulders at the systemic complexity, as if the mystery were too complicated. They advocate no change in pesticide policy. After all, selling poisons to the world’s farmers is profitable. Furthermore, wild bee habitat shrinks every year as industrial agribusiness converts grasslands and forest into monoculture farms, which are then contaminated with pesticides. To reverse the world bees decline, we need to fix our dysfunctional and destructive agricultural system. 90% of the fish stocks in the ocean are being harvested at a rate too fast for the sea to replenish. People and animals in PA are getting sick because of the environmental impact of fracking on their environment. The Alberta Tar Sands project is the largest land operation in the world. It could grow to the size of New York before all the Bitumen is extracted from the earth. The tar sands di bit is the dirtiest fuel on earth. GMO corn is now banned in eight nations including Hungary, France and Mexico, but not in the US, due to the negetive impact it has had on the environment. Beef and chicken are unofficially considered frankenfoods thanks to the extensive use of steroids, antibiotics and genetic manipulation to produce livestock able to grow bigger and faster in time frames not possible to achieve without the use of these methodologies. See Food Inc as reference. The minds behind the operation have designed a stock message describing a mundane day and draconian boss, only with trigger words of nefarious activities. The words, if read by a computer system without context, can indicate suspicious activities. Hey! How’s it going? I’m all right. This will be the ultimate test of how well the government spends our money. PHD Comics does it again in terms of explaining a fundamental property of reality through the seemingly magical lenas of Quantum Mechanics. Had to put this in about Prism from the Washington Post. Pretty informative to say the least. Seen below is a graphic showing a "how To" for techs who use this most powerful and intrusive technology to spy on us rubes. 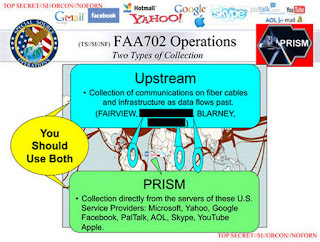 In reality, Big Brother, formerly know as the Total Information Awareness program, has morped into prism, a bigger and better way to spy on us using ever faster tech imbued with AI and ultra fast connects to the web, allowing said environment (NSA) to spy on anyone using digital systems (smartphones, tablets, laptops etc., etc.) linked to the internet. A this point in time, Prism is Big Brother edition 2013 but we already knew that, right? To this end, BRT has posted numerous blurbs about this disquieting development for quite some time as seen in a post titled Face Off & Then Some discussing face recognition and the NSA's now completed project of building the most powerful surveillance environment known to man (Bluffdale, UT). It gets creepier. 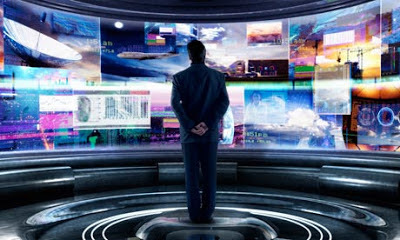 With predicative analytics an essential part of big data, the notion of having a digital facsimile of the pre-cogs of Minority Report is not far off, something the NSA, among significant others, is avidly developing as this tech, supposedly, would not have the foibles of humanity as seen in Agatha, the most powerful of the three Pre-Cogs used by Pre-Crime, the special police force of the future circa 2054. 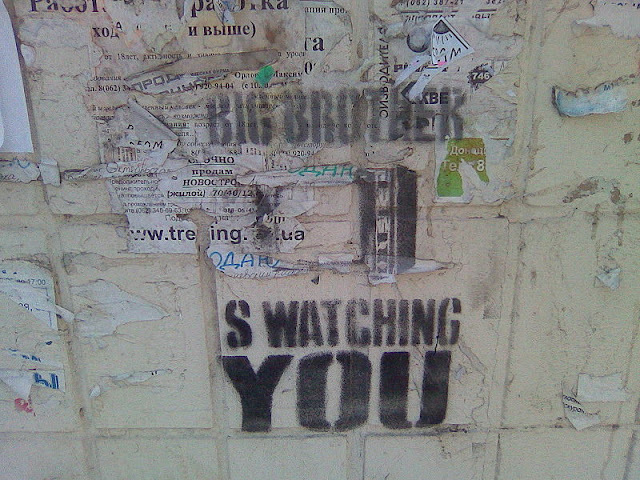 From 24/7 surveillance, courtesy of Prism, to the empty promise of energy independence from our beloved president, the incessant drumbeat of platitudes of newspeak issue forth from the corporate controlled press mimicing Minitrue, the political organ of Ingsoc, the party of Big Brother. The Insoc logo (i.e. English Socialism) seen above, inadvertently shows how Democrats and Republicans go hand in hand when it comes to the really important things in life, i.e.1. Get elected 2. Stay in power by getting reelected and 3. Server the powers at be who enable the pols to stay in power by funneling money to their never ending campaigns for the sole purpose of getting reelected. With this in mind, some really smart wag stated, with true insight, that America is now a combination of 1984 and Brave New World with newspeak spouted by our politicians to explain away Iraq, Afghanistan, due process and energy independence while big media and the process food giants ply us with football, Cheese Doodles and machismo in the quise of huge trucks, beer and never ending patriotism. 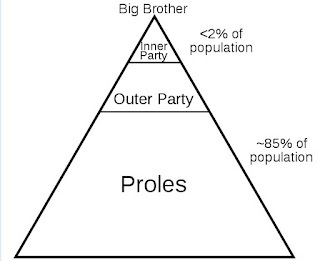 Seen above is the stratification of society in 1984. Looks familiar doesn't it, especially when one substitutes the entities depicted with ones we are familiar with. i.e. The president, Congress/power elite, government workers and us rubes. Makes one think doesn't it?